The Blue & White football game is one of the most highly-anticipated events of the spring season at University Park. Fans, friends and alumni alike gathered together for a day of tailgates and an eager return to Beaver Stadium to watch a classic Penn State football game. The weather was perfect as the Homecoming Executive Committee walked onto the field at halftime to reveal the logo to the crowd of 71,000. They lined up in front of the student section and dropped the banner revealing the logo. The process for the 2018 logo began in a graphic design class as an assignment. Each student is tasked with creating a logo that encompasses the 2018 theme, “Guide State Forward,” and captures the essence of Homecoming. There were 14 submissions, and the Executive Committee narrowed it down to three finalists before ultimately voting on voting one. 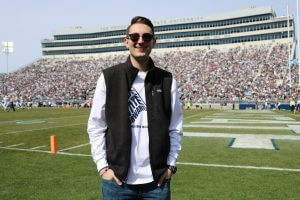 On Saturday, Frank Kleinsorge had the opportunity to reveal his creation with the Penn State community. “Penn State is all about tradition and taking pride in this university. When I designed this year’s Homecoming logo, I wanted to make sure it paid homage to the Penn State culture while also serving as a representation of a brighter future,” Kleinsorge said. His vision brought this year’s theme alive. “Just as the Nittany Lion leads us into every football game, he is also our guiding force into better and brighter futures,” Kleinsorge said. It’s hard to include a logo for Penn State without including the iconic Nittany Lion. The Lion in this year’s logo shows true leadership and bravery in moving forward fearlessly. “Just as the Nittany Lion leads the team into Beaver Stadium at every football game, he also guides us to a successful future. 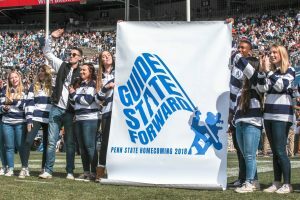 No matter if you are an alumni or current student, ‘Guide State Forward’ is a theme that resonates with everyone, and it was an honor to design the logo for Homecoming 2018,” he said. Congrats for achieving such a daunting feat.It takes someone special to be on top of his game.Your display of mastery of your major is astounding.We’re all proud of you!